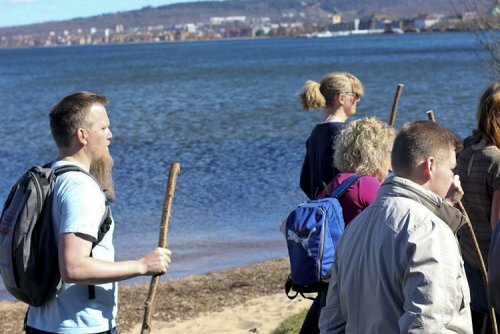 At the invitation of Bishop of Växjö, Fredrik Modéus, the Christian churches in Jönköping organized a weekend aimed at young adults aged 17-35 years old, from 20 to 22 April 2018. In mid-April, all priests and deacons from Växjö diocese in the Church of Sweden gathered in Växjö Cathedral for their four yearly meeting. Among their guests were two brothers from Taizé. The Bishop made a double invitation to them: firstly, to give Bible meditations for the priests and deacons, together with an evening prayer open for all in Växjö Cathedral, and secondly to help lead with the local Church a weekend for teenagers and young adults in Jönköping the following weekend. In Jönköping, the churches of the city welcomed the participants all together. Five prayers took place in Kristine church, where many of the participants also took part in the Sunday Eucharist. Collecting Växjö diocese’s young people in Jönköping on an April weekend proved quite difficult - many high school students had to work hard at school during that period, and the train and bus connections within the diocese are not the easiest. Surprisingly, there were more peple from further afield: one group came by bus from Malmö, and another group had travelled from Malmberget in Northern Sweden to join. The invitation had also been opened to participants of all ages quite early so that older adults and confirmation candidates could take part. The prayers, one on Friday night, three on Saturday and a morning prayer on Sunday, were of course open to all. The Kristine church was adorned with the icons familiar in Taizé meetings: the icon of the cross and the friendship icon, and several other icons that had been place in the choir of the church. 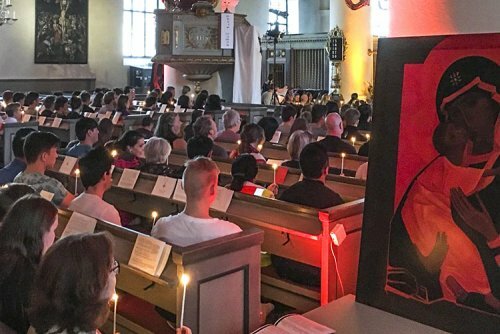 The invitation was not publicised much outside of Taizé, but nevertheless it reached a few people from outside of Sweden, and the diocese also had some of its own guests, so the Bible readings during the prayers could be heard in Swedish, English, German, Tigrinya, Aramaic, Spanish and Polish. Saturday’s Bible Meditation came from the same text Zacchaeus climbing into a tree to try and see Jesus, before Jesus calls him down into a life-changing encounter. Bishop Fredrik Modéus attended the meeting on Saturday and Sunday. The planning group in Jönköping had worked out a wide range of workshop hours, including a pilgrimage along the Vättern Lake to the Romanian Orthodox Chapel, a former hospital chapel in an area that has housed a hospital for children with epilepsy. Another group met youth from Jönköping’s three Syrian Orthodox churches and learned to read and sing the Lord’s prayer in the language that Jesus spoke, Aramaic. It also became a lesson in the history and diversity of the Syrian Orthodox Church. In the porch of Kristine Church there were apples, water and bread for all. A short walk into town led everyone to the lunch restaurant where the participant card served as an entrance ticket and where the warm food was served. After Sunday’s service, many had lunch on the upper floor of the Kristine parish house. "Many years ago I came to Taizé for the first time. Today, I’ve experienced a bit of Taizé, here in Jönköping," wrote Bishop Fredrik Modéus on Twitter. "Happy for community with people from all over the world, touched by good worship and grateful to all the youth in Christ’s church."